Did you know that crochet hooks have names for each and every part and feature on them? What seems like an innocent cylindrical object with a hook on one end actually is full of subtle curves, recesses, and other parts that make for a sophisticated yet simple tool. Above I've labeled the most basic parts of a crochet hook...just like us, a crochet hook has a head and a body. The green hook shows starting at the tip top, the point (where one inserts the hook into the work), the throat, the shank or shaft, the thumb rest, also known as a "pad" or "grip." And finally, the handle. Upon closer inspection, you might notice the throat area of some hooks is flatter, that is called "inline." Some have a more smoother transition, which is referred to as "tapered." As you can see, crochet hooks have the same or similar basic parts, but there are subtle differences in the shape/size/depth of some of the parts and materials used to make the hook. In the picture above, the hook on the left is a metal/plastic combination with a rubbery thumb grip, the middle hook is wood (birch), and the green one on the end is metal (aluminum). Some have ornate beading, some light up, and so on! 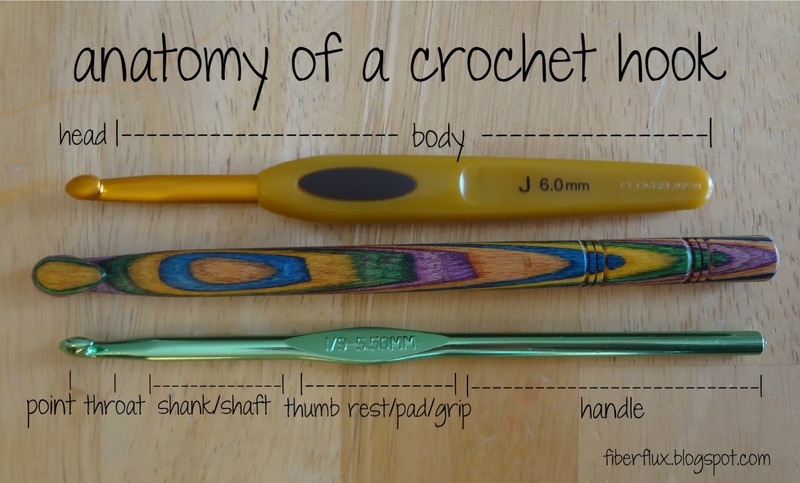 There are crochet hooks available that can be wonderful pieces of functional art. As you can see in the photo below, some hooks are shallower or deeper, some come down farther in the front like the one in the center does, and so on. This is really a personal preference and depends largely on your working style...the way you hold your hook and how you manipulate it while working a stitch. My recommendation is to try a few different styles and see what you like best. Speaking of preference...I wanted to mention handles too. As seen below, handles can take many forms. Some can be more ornate with carving, curvature, or beading. Some are ergonomic, like the Clover J hook seen below, and are amazingly comfortable. However, I think you can get some serious mileage out of a basic metal hook like the one below in green, and a very economical choice too. So fellow crocheting friends, I'd like to ask you...what hook(s) do you favor and why? I would love to hear your thoughts! Happy crocheting to you! Great post! I can now call my preferences by their names. I prefer a Boye hook because of the tapered throat (and the price). I do wish I could find a way to make the pad more comfortable. Right now I'm using a bought grip with a pencil pad glued onto that. Any ideas? I like Boye too, Clover right now is my favorite. And wow! You are so resourceful coming up with your own grip! I recently saw a "sleeve" of sorts in the yarn area of the craft store, you slip your own hook in it and it was made by Boye as well. I think it said it was ergonomic and it was around 7 or 8 dollars. That might be helpful. I kind of like the sleeve idea, as long as you could use it with a variety of sizes. Happy crocheting! OOPS! I was wrong! The place is called www.CreateForLess.com & here is what I recently bought for less than I stated above! Hope this helps! Thanks Kathy for sharing all of this great info! I love those Clover hooks, they are my fav. The wooden one I also have but the hook part is so deep I catch it on yarn a lot. Great post Jennifer. Yes! Clover hooks are totally awesome, they are so comfy. I wish they made them in the wider sizes though, they only go up so high. I do love that wooden one too, I can what you mean about catching, very comfy to hold handle though! I am new to crochet and I am learning with the aluminum hooks. Maybe later I will try some other styles. I started with aluminum too...a good, easy to use hook! I am using a metal Boye hook to make crocheted lariat type necklaces. I bought inexpensive green rubber/foam/something sleeves in one of the craft stores and slipped the thinnest one on first and then the larger one over it. I will try a pencil grip too. Good suggestion if it works on a thin hook. I'll have to try those too...they sound comfy! Thank you for this info, I only use Boye, its easy & I can gain speed with it, I love the looks of the birch its so pretty, but I think I will stay with the Boye, Im comfortable with those hooks. I am going to try those sleeves. Love to read you postings. Thanks! I like Boye too! I'll have to try those sometime, I've used plastic knitting needles, but never crochet...got to love the different colors too! Great post Jen. I learned on metal Susan Bates hooks; years later I switched to the Clover and loved them. Now I'm using metal hooks by HiyaHiya that I got at a knitting shop-they were only 2.95 a hook. I tried one wooden hook but don't care for it. I am picky about the head of the hook and like it more rounded; some are too pointed or slanted. But whatever hook I use I am happy when crocheting. Thank you Jen for the time you take to share info and patterns and ideas! Thanks Linda! Oh yes, HiyaHiya are nice, they make lovely knitting needles too! wood and bamboo are not detected at control airports ....... then I can crochet in the plane, for longs travel are the best!! Great tip, thanks for sharing!!! My preference is aluminum because they slide better, and the green one shown is my favourite aluminum style. I tried the red heart aluminum ones but the way the head is cut I find they shread my fabric.... I might try bamboo later (once I get better) but they looks like they would not slide easily..? I guess its a personal preference but I absolutely love bamboo, for both knitting and crochet...they are very smooth and the longer and more you use them, they get smoother over time...really enjoy them. I have several clover hooks. Right now I'm using a Boye with a rubberized handle. I really like it. I have RA and I've found that the rubberized one or the ones with wider handles (bodies) are easier for my hands. The aluminum ones are what I started out on along with the steel ones with the teeny hook. I'm a big fan of clover, love their wider handled hooks and their bamboo products too! I drooled when I saw your hand-painted crochet hook, talk about a thing of art & beauty!!! I would wear it in my hair as a "chignon stick" or a hair-stick for any "up-do"! It's too lovely not to show off in public!!! :-D As always, my lovely...HAPPY HOOKING! I prefer metal hooks, usually Boye because we have tons of those at home, over plastic. The plastic hook I used was bendable and just didn't feel right. I would love to try out wooden hooks, but don't have the money (going to university does that, hehe). I know somewhere at home, buried to be found again five years from now, we have my mother's grandmother's ivory crochet hooks. If I wasn't scared of damaging the ivory hooks, I would use them for something very special and at home only. A piece of history. Wow! So neat to have your grandmother's hooks, a wonderful family heirloom. I like my hooks to be nice and sturdy too with little to no flex. What's the name of that plastic hook you used that's bendable? Super, great info!!! Have you tried the Tulip Etimo crochet hooks? Available on Amazon. I have become totally "hooked" on the Tulips. Extremely comfortable to use, a little costly (about $8+), but well worth the effort to get one and try it out! Thanks for sharing...they are awesome! I've just started crocheting and here in the UK I have been using the addi swing crochet hook which has a lovely ergonomic handle. Thank you for this brilliant website. Im going to crochet the flower patch button wrap in Manos del Uruguay wool clasica colour 6554. My favorite hooks are Clover Amour. Smooth, easy and comfortable to hold and use, it has the same same top and throat as the Clover Soft Touch, but I just love the grip. Next in line comes the Soft Touch. I have some Boye; I needed a K, and that was what I could find. It's ok in the larger sizes for me. I have yet to get my hands on a Tulip Etimo, but they're on my wish list. I have always used either Coates or Milward aluminium hooks - but the larger ones are usually some form of plastic. They slip well too ... I have been crocheting since I was about 11? when my grandmother taught me the rudimentary stitches. I then went on to teach myself from books. [I am 59 now!] ... My FIL just asked for hooks as he wants to start crocheting too and he is 89 !!! He fancied and ordered some of the bamboo hooks. I tried them out for him :) I was actually disappointed as I found they didn't 'slip' well ... they caught a bit and I could feel the friction with the lighter weight yarns. I am not sure if they can be rubbed down with sandpaper to be smoother - but I think I'll stick with my usual hooks !! Although, I might be tempted by these lite hooks for when I am working on dark yarns as my eyes are getting bad these days ! Hi sorry for rehashing an old post. I am just sarting up crocheting, Im happy to experiment around until I find the best brand at moment I have a clover size 6 and another padded handle size 4. This question is not so much on which brand. In all the vidoes i am watching to learn the tutors have much larger size hooks and wool. I know that maybe is to help us see. But would it be easier to learn to start like that. So far I can chain on ok but am struggling with sc or dc as its so small. Would you guys thinkg if i staetred with larger hook and chunky wool it would help ?